As discussed in the previous entry, colours, which sit across from each other on the painters colour wheel, are considered to be complementary and a result, they appear to the eye to balance each other in a satisfying way. Red is complementary to green, orange to blue and yellow to violet. The brightness values influence the ideal balance proportions of the three complementary pairs. For example, red and green each have a brightness level of 6, so are considered to be balanced at a ratio of 1:1. However, orange has a brightness level of 8, which is twice as bright as blue, thus the ratio is 1:2. 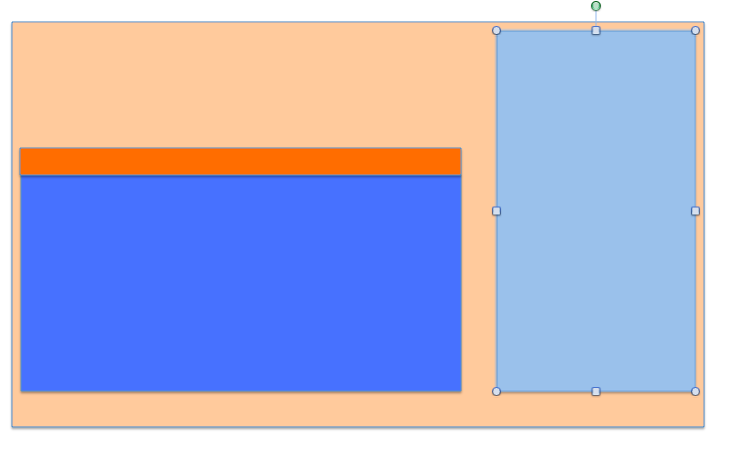 This allows blue to occupy twice the area of orange to compensate for its lack of strength. Similarly, yellow is three times as bright as violet thus, violet should occupy three times more space than yellow. Part two asks for three of four photographs, which features colour combinations that appeal to me. They can be combinations of two colours or more. The objective is to show that there is no single ‘correctness’ to complementary colours. Look at the colour balance in these photographs and study its effect. 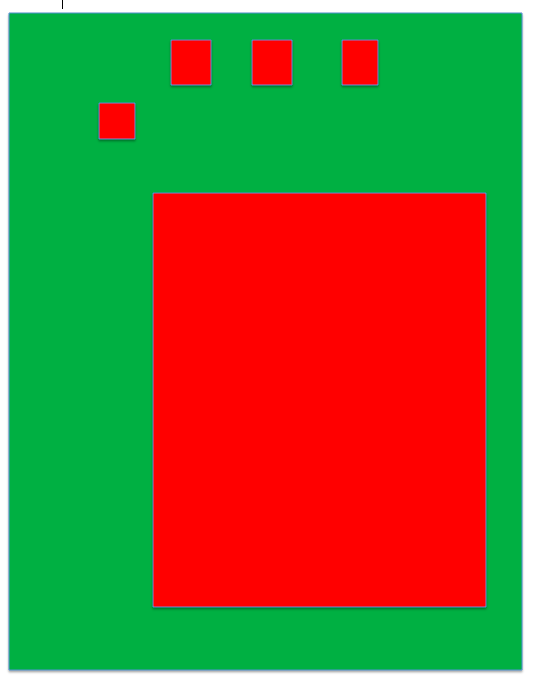 Red and green have equal luminosity and combine harmoniously, when they are pure and exact, to proportions of 1:1. When viewed together as unadulterated hues, red and green exhibit optical vibration. Freeman (2005, p94) describes optical vibration occurs along the edge between two intense colours that contrast in hue but have similar levels of brightness. The effect is that the edge seems to fringe or vibrate, which can be irritating to look at but is also eye-catching and dynamic. For this photograph I selected a robust-looking red flower, a warm colour set against a background of green foliage, a cool colour. This gives the impression that the red is advancing while the green recedes. I looked at this edges where the red and green meet to note if there was any evidence of optical vibration, but did not see any fringing. I think this may be because the saturation of the hues varied throughout the image. I cropped this image slightly at the top of the frame and at the left hand side to make the colour proportions closer to 1:1. As orange is as twice as bright as blue there is little optical vibration to be seen, making this combination of colours more comfortable to look at than red and green. They also have the strongest warm/cool contrast of temperature of the three primary and secondary colour combinations. Freeman (2005, p88) describes this contrast as a contrast of sensation as there is a sensory association between colour and temperature, humidity and time of the day. Freeman (2005, p125) notes that reflective surfaces can pick up on the tones and colours of the environment. I took this photograph at Dubai creek side in the late afternoon. I think the warm glow of the low sun reflecting on the coloured glass has made the orange appear stronger. Although the colours in this shot are not pure I think harmony is still achieved through the warm/cool contrast. The colours in the image below are a lot stronger, particularly in the painted cart. A slight crop has been applied to make the proportions adhere more closely to the desired ratio of 1:2. This combination contrasts the brightest and darkest colours in the spectrum. 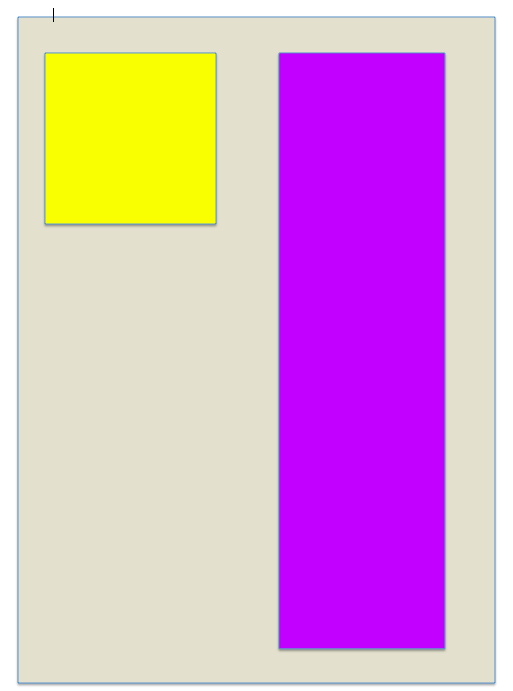 Goethe placed a brightness value of 9 on yellow and a value of 3 on violet meaning that violet needs to occupy three times more space than yellow to be balanced. As noted in the course text, the rarity of violet in photographic subjects made this combination a challenge to find. It took several outings for me to find a subject that would be a close(ish!) match to the colours. I spotted these shop facades while walking in Bur Dubai, an area of Dubai. On returning home I realised that the ‘violet’ in this shot was probably closer to a magenta/orchid hue. I also had to apply a heavy crop for the ratios to be close to 1:3. Still, I think the brightness and darkness of the colours are evident enough to show contrast. The tight framing also made me consider what active framing and passive framing as discussed by Shore (2007). For some pictures the frame is relatively passive, it is simply where the pictures end. When viewing a picture with a passive frame, the viewer knows that the world continues beyond the edges of the frame, but is content with what is “inside”. 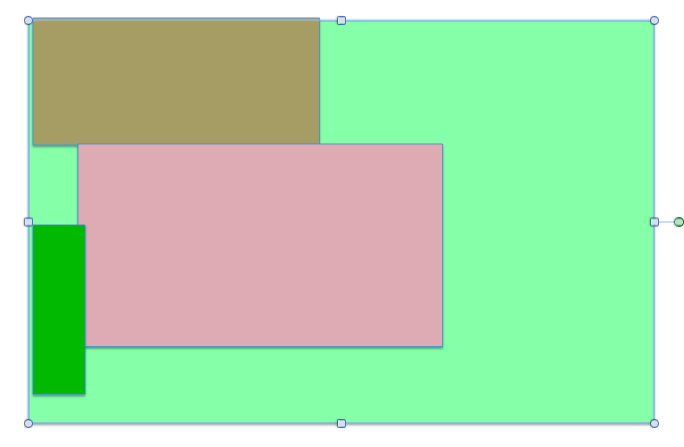 For other pictures the frame is more active; the structure of the picture begins with the frame and works inward. The edges of the frame are activated, and we are very aware that the world continues beyond the boundary of the photograph. On consideration, I think the framing in this shot could be considered active. The image below is another example of a yellow/violet combination at a ratio of around 1:3. The framing was better here which meant no cropping was required. Part two asks for three of four photographs, featuring colour combinations that appeal to me. I should look at the colour balance in these photographs and study its effect. I took this photograph on a visit to nearby gardens. I liked these colours together as they are all desaturated and this, to me, made the colours and plants appear delicate. The greens are paler than a pure green with hints of yellow. The pinks are very light, almost white in a few areas. Freeman (2007, p123) notes that brown is, technically, a heavily desaturated red. He describes it as a classic broken colour, with earthy connotations. The brown here also contains greens and pinks, giving it a khaki-coloured look. Both the pink and brown have originated from red. 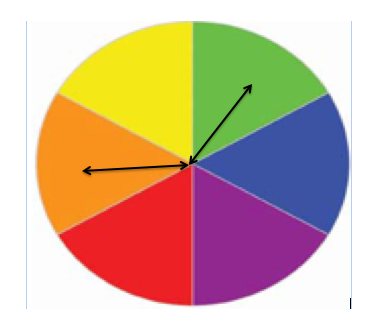 This colour wheel I found at http://creativecurio.com/2008/05/the-color-wheel-and-color-theory/ helps illustrate how adding white could create the pink and the brown by adding grey or black. 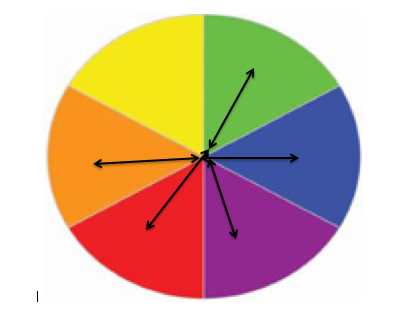 Red is opposite green on the colour wheel. Freeman (2005, p96) notes that harmony with opposite colours lies in successive contrast. Successive contrast is where the eye reacts to a strong colour by creating it’s complementary, the after-image, after exposure. By supplying the opposite colour the eye creates a balance. Therefore there is a balance of complementary colours, albeit muted, in this image. This image shows a row of glass bottles featuring the painters’ primaries red, blue and yellow. The colours are not pure but still have high levels of saturation (with the exception of the light blue on the left of the frame). I noted the levels of saturation on Photoshop as follows R = 95%, B = 91%, Y = 75% and the LB = 27%. 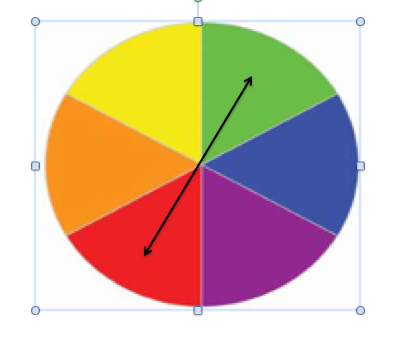 As noted in Freeman (2005, p96) any colour combination that is symmetrical around the middle of the colour wheel has a potential blend that is neutral, therefore balanced. This can apply to groups of 2, 3 or 4 colours. The red, blue and yellow symmetry can be seen below. 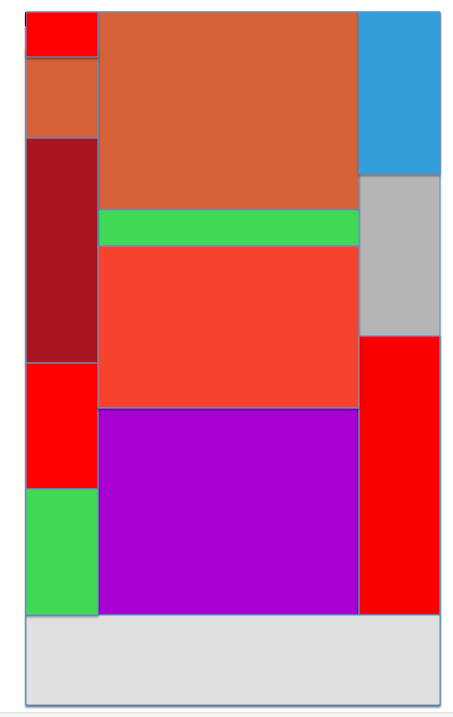 Yet, as I discussed earlier each colour varies in brightness; red = 6, yellow = 9 and blue = 4. 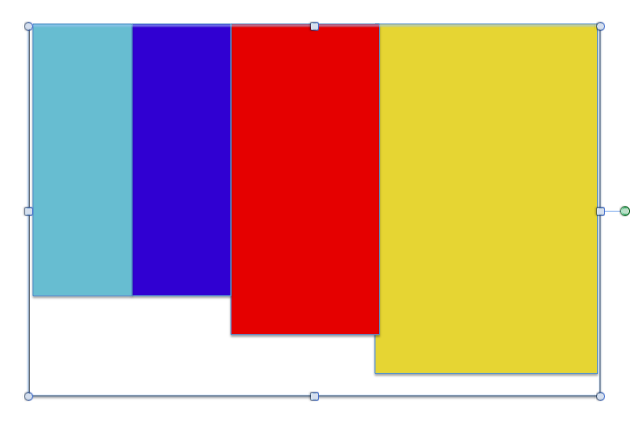 This would mean that the colour proportions that are conventionally considered to be harmonious would differ from those above as blue would occupy the most space, followed by red and then yellow with the least. I did consider cropping the right hand side of the frame to reduce the yellow area. However as Freeman (2005, p99) notes, adhering strictly to the colour harmony rules and principles can create a mechanical, predictable effect thus some imbalance can be good to add dynamism. I took this image in the glass house of a botanical garden. It is a good example of colour harmony through spatial contrast. 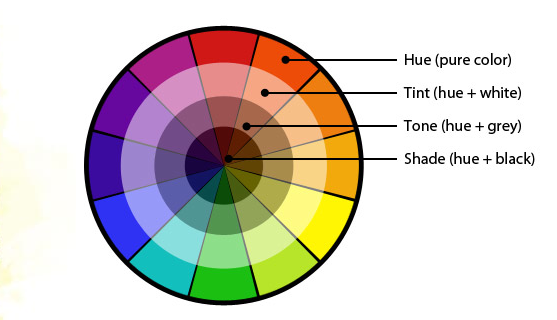 When one colour is very small in the frame, the proportions become irrelevant as the small area of colour becomes a colour accent and the eye is drawn to it. Freeman (2005, p110) notes that it is paradoxical that sometimes a small colour accent gains more perceptual strength from its location. I placed the large pumpkin slightly off-centre to be moderately dramatic without being too extreme. I also placed it low in the frame to mirror the way it grows, at the end of a tendril, sitting on the ground. The two small orange flowers on the left hand side of the frame make the elements dynamically balanced. 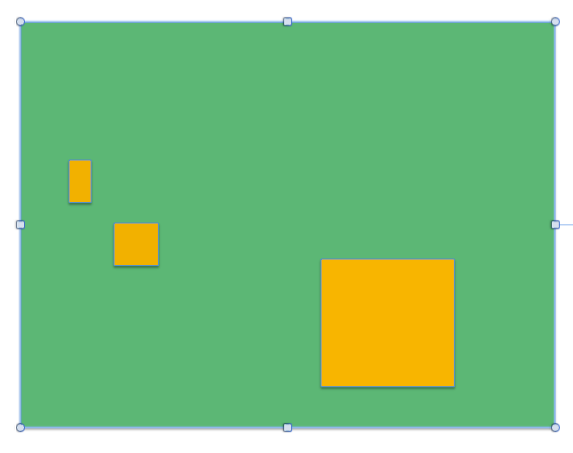 In terms of colour balance, the green and orange combination does not fit with traditional colour harmony thinking, it would be considered imbalanced. However, I think it works well as the orange is light and not an orange/red, thus making it calming to look at rather than irritating. Image four is a close up of a stack of bowls on display at a local souk. It contains colours from every section of the colour wheel except yellow, which means the colour is not balanced. Freeman (2005, p112) notes that just as the concept of colour harmony is loaded with personal and cultural values so is it’s opposite, discord. Beyond optical and perceptual principles, discord is the idea that certain colour combinations clash, are not safe and do not work together. However, these assumptions are very much based on culture, opinion and fashion. I would perhaps not choose to decorate my home, or wear an outfit encompassing all the colours in this photograph but I do think the assortment of bold colours attracts attention and in some way reflects the character of the souk I spotted them in, colourful, ornate and unusual. This exercise has taken me quite some time to research and compile as I quickly realised that colour harmony was a far larger concept than I had initially realised. My main findings are that harmony can be achieved not only through combinations of complementary hues, but also through contrast of brightness, saturation, sensation and space. However my research asks for caution in adhering to these principles too rigidly, as this can produce predictable results. This suggests that while an awareness of colour relationships in photography can be used to good effect, some imbalance can also add dynamism and interest to an image. This entry was posted in 15a- Colour Relationships and tagged Color wheel, Complementary color, Secondary color on May 16, 2013 by catherinefinniganphotography.